Every now and then, while browsing through rare and early newspapers, an article is discovered which causes one to take a second look – or 2nd read. Such is the case with a report in the New York Semi-Weekly Tribune of January 30, 1855. 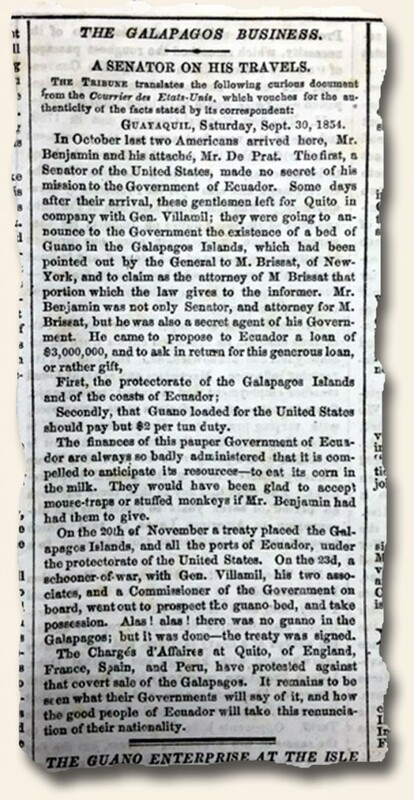 As I was scanning through slavery and Mormon related coverage, I discovered an inside report which described how Ecuador tricked the United States into signing a treaty in which the U.S. would provide protection for Ecuador’s ports and the Galapagos Islands (owned by them) in exchange for access to the supposed endless supply (by the ton) of guano on the Galapagos Islands. Apparently, Ecuador had produced samples of highly potent bird and bat dung which motivated the U.S. to sign the treaty. Later, upon investigation, it was found out that the tons upon tons of guano was simply a pile of hooey – that is, nowhere to be found – but the treaty had already been signed. Who signs such an agreement sight unseen? I must admit, the nature of the agreement stirs all of the middle-school boy sarcasm which I thought I had long-since put to rest. However, such is not the case. He’s in there. How the West Was Won – Go East Young Man?